Size: 5 1/4" wide x 3 3/4" tall x 3 1/2" deep. First Year Issue Price: Varies see Comprehensive listing. 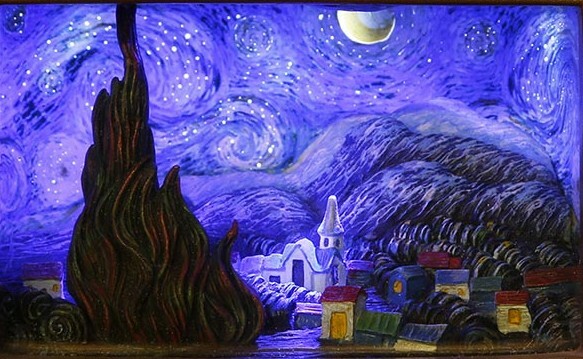 HISTORY: To celebrate Olszewski's 40th year creating miniature art works, he created Vince Van Gogh's masterpiece "Starry Night" in miniature in a Gallery of Light form. 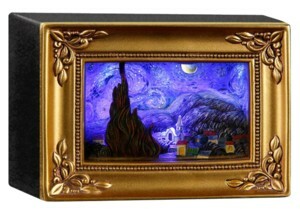 The Gallery of Light "Starry Night" is being sold on the artist's online store.